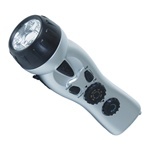 1LED or 3LED Flashlight, AM/FM Radio, Cell Phone Charger and Emergency Alarm. It’s a Bird, it’s a Plane - no, it’s a wonderful new portable air conditioning unit. It looks small but will cool an 1800 sq. foot area. Just kidding. It WILL keep you cool under the hot sun. The solar panel needs to have direct exposure to the sun, and will work until you take it out of the sun.